Low self-esteem can lead to many issues like: an inferiority complex, depression, suicide, isolation, abandonment, self-destruction, and relationship failure, etc. Believing in yourself determines how you see yourself and how you feel about yourself. Your lack of self-belief is obvious and very telling to those around you, and to those who are watching you. You are not an achiever. Now, some may argue that some achievers have low self-esteem. Not if they’ve worked for what they have. Being given success on a platter? Very possible. I would argue that an achiever who has done the work, labored in the trenches, toiled when most folk were sleeping, writing, studying, focusing on their goals and strategizing on how to reach them, do not have any problems in the areas of self-esteem. Putting thought, time, sweat, and sacrifices to meet the goal are all “self” builders of fortitude, endurance, courage to fail, strength to succeed, and determination to keep it pushing. When that goal has come into fruition, when what you have envisioned comes into reality, and when your hard work has paid off? That is downright inspiring! That type of inspiration speaks to the possibility of many more accomplishments. It is a confirmation that you can do it!!! Inspiration is more concentrated on the edge of wanting to do something. It is more about the “Just do it” (Nike). It is less focused on the belief of doing it. Inspiration is not primarily driven on the hesitation of doubt. Rather than struggling with your belief in whether you can do it or not, just drive on the adrenaline of inspiration! Jump! Take the leap! Inspiration is removed of fear, so you just do it. It is for you and what you want! Go for it!!! If you lack self-esteem, get inspired! Reach out to someone who is inspirational! Hold on to that one person or that one thing that inspires you. Reach out to them every…single…day. If it is a 20 minute video, play it every day. If it is a quote, read it every day. Enlarge it and post it on your wall to look at daily. If it is a song, play it every day! There is so much inspiration out there! There are so many folk changing their lives, and doing a 360 by accomplishing something they didn’t think they could do. They are being inspired and are gaining more inspiration by each victory they win. Inspiration is their answer to making their lives better. And in doing so, they are building their self-esteem and boosting self-confidence one inspiration at a time. 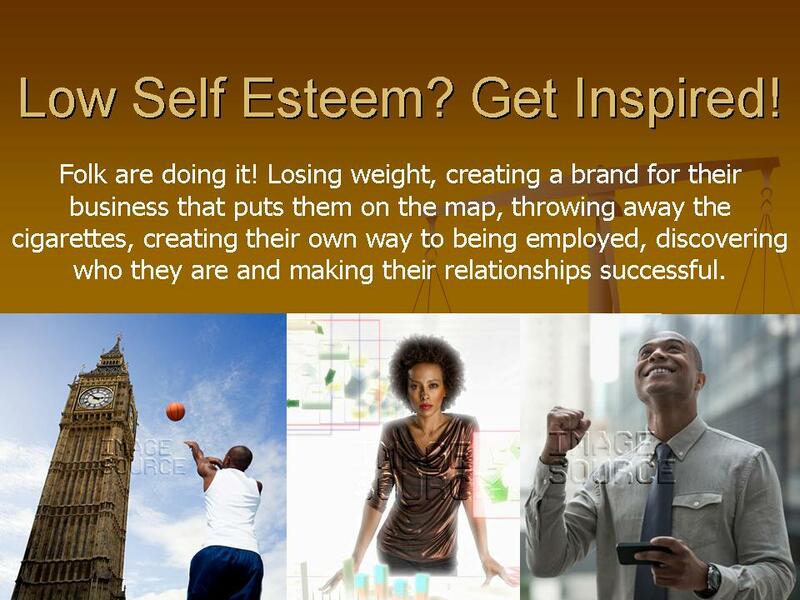 Accomplishing their goal, is the one thing that catapults their low self-esteem into a tower of self-confidence. Folk are doing it! Losing weight, creating a brand for their business that puts them on the map, throwing away the cigarettes, creating their own way to being employed and making money the way they want, while overcoming self-defeat, and making their relationships successful. Find one story that inspires you, and work it to the end of your achievement. Once you’ve accomplished your own success, you become your own inspiration! You are well on your way to meeting your goals one inspiration at a time. Here are some sites you may find inspiring. Find your muse of inspiration, make your success, and boost your self-esteem! It will work wonders in your life and wonders in your relationship. This entry was posted in Self and tagged fix your relationship by boosting your self esteem, inspiration can help boost self esteem, low self esteem, overcome low self esteem. Bookmark the permalink.